It feels a bit early for me to start thinking of Christmas. Drifts of research and reports surround me; calendar reminders twinkle on my screen, and it wasn’t too long ago when a hard thump of an icing sugar duster covered my garden with snow. Maybe it’s not too early for me to start thinking of Christmas. Two things easily get me into the Christmas spirit—music and food. While I am prone to belting out “Do They Know It’s Christmas” in June, I’m not quite ready to put my Christmas CDs in the mix just yet. The Christmas Pud has been stirred, steamed and safely out of my mother’s reach (really, it’s not hard as she’s 4’10” (maybe)). While I’m beginning to plan out my baking, it’s hardly a Bing Crosby existence, rumpapumpumming to David Bowie. I used this week's visit with some favourite people to get me further into the festive spirit. How better than with a cake? Preferably something aromatic that hints at the weeks to come. I thought the Chocolate Gingerbread Cake from Nigella Lawson’s Feast would be perfect with our tea, as we chat next to a roaring fire. 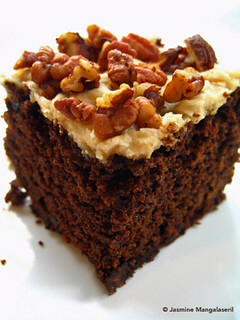 I paired the smoky-rich chocolate spice cake with the salted brown butter caramel icing from Shuna Fish Lydon’s Caramel Cake. 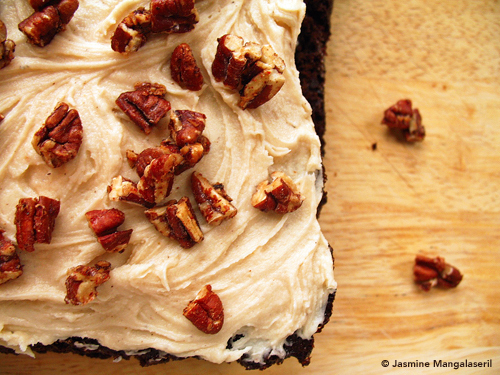 For a bit of texture, amidst all that soft lusciousness, a generous handful of roasted spiced pecans was scattered on top. By my standards, it’s a sweet enterprise, but all that means is I'll have a smaller slice. But it is a dark, damp and rich cake, spiced with flavours familiar to the Yuletide season, with the added bonus of chocolate. And salted caramel. And crunchy pecans. The full cake recipe is enough for two 20cm x 20cm (8"x8") pans, so if you only need a small cake, halve the recipe. Instead of treacle, I used cooking molasses, which is a mixture of regular and blackstrap molasses. My molasses-loving friends liked it, but next time I’ll use a lighter variety. For one 20cm x 20cm cake, use about one-third of the icing specified in the recipe (or more, or less, I'm not going to judge). Preheat oven to 180C/350F and line a baking tray with parchment or tin foil. Mix the nuts with the sugar, spices and salt. Drizzle in enough water so the nuts are coated with a glaze. Toss the nuts and spread on the prepared baking tray. Bake for 10 minutes. Let cool before sprinkling on the cake. From my PR blog: You're an expert. Cool. Hello all my lovely people. Calder: Quite frankly, what’s the palate? Do they know how to write a recipe? Now that every blogger’s got a book I think, where’s the authority? I think we’re missing a sense of authority right now because everybody’s an expert. Everyone’s a photographer, everyone’s a writer, everyone’s a curator. There's more than an ounce of truth in those words, if my inbox is indication. It got me thinking of about how it seems everyone is trying to position themselves as an expert, regardless of their actual knowledge or skill. Every day I receive pitches from publishers, PRs, and marketers telling me about their latest cookery expert, nutrition expert, lifestyle expert, agriculture expert and other experts related (and some not related) to the food industry. I also get messages directly from unknown experts trying to convince me I should write or tweet about them, let them write for me or recommend them for media interviews, panels and other brand-building exercises. Unfortunately, many aren't experts. Yes, they've mastered free, low-barrier publishing and sharing platforms, amassed followers and have a self-published book on Amazon, but these points don't really mean much if these "experts" don't have the chops. It's as if they bank on being the smartest person in the room when they don't know whom else is here. It's really as if they're looking for a shortcut to the twinkly rooms of legitimacy and celebrity where champagne flows freely and life is just one big, never ending party with Idris Elba as the DJ. I jotted some thoughts on my PR blog about what I see as the cult of expertism. It may help to explain why influencers--including the media--ignore many pitches about experts.